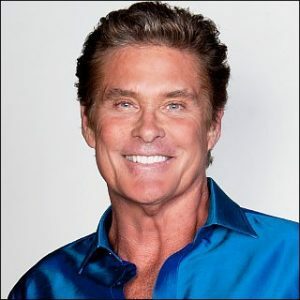 David Hasselhoff is an American actor and singer who achieved recognition starring in the American television soap opera The Young and The Restless, where he played Dr. Snapper Foster. He received further recognition for his starring role as Michael Knight in the popular 1980s show Knight Rider and as L.A. County Lifeguard Mitch Buchannon in the 1990s series Baywatch. In addition to acting, he is also an accomplished singer and popular recording artist. His best known hits include “Jump In My Car” and “Looking for Freedom”. He was also in the eleventh season of Dancing with the Stars in September 2010. Born David Michael Hasselhoff on July 17, 1952 in Baltimore, Maryland, to Dolores Therese and Joe Hasselhoff, he was grew up in Jacksonville, Florida and Atlanta, Georgia. He belongs to German, English, and Irish descent. He attended Marist High School in Atlanta, Georgia, and graduated from Lyons Township High School in La Grange, Illinois in 1970. He also attended the Academy of Dramatic Arts in Michigan and the California Institute of the Arts in Valencia, California. He married Pamela Bach in 1989, and the couple had two daughters: Taylor-Ann and Hayley Hasselhoff before getting divorced in 2006. He was previously married to Catherine Hickland from 1984 to 1989. *He was born on July 17, 1952 in Baltimore, Maryland. *His mother died from a stroke. *He was once engaged to Roberta Leighton. *He launched a MySpace-like social networking site, known as “HoffSpace” in 2008. *He is the supporter of Scottish football team Partick Thistle F.C. *Follow him on Twitter, YouTube, Google+, Facebook and Instagram.